Judge Robert N. Scola, the federal judge presiding over a Motorola Mobility v. Apple lawsuit filed in the Southern District of Florida in 2010 (to which Apple added HTC as a defendant against counterclaims over six patents), today granted a couple of HTC motions to sever Apple's claims against HTC from the ones against Motorola Mobility and to transfer the case to the United States District Court for the District of Delaware, a court whose chief judge doesn't seem to like all of Apple's litigation tactics and which has previously stayed all of Apple's lawsuits against HTC pending in that district. HTC certainly hopes that the Delaware-based court will also stay this Apple lawsuit. But since an HTC v. Apple lawsuit is still progressing there (to which Apple was not allowed to add four counterclaim patents), it's not a given that this case will be stayed following transfer. Judge Scola explained the rationale behind this decision in HTC's favor by pointing to last year's U.S. patent reform bill, the Leahy-Smith America Invents Act (AIA). In an effort to up the ante for patent trolls, that law heightened the standard for joinders (i.e., for suing multiple defendants in one case in the same district, which is what trolls used to do in the Eastern District of Texas for the most part). Apple is not a troll, but the AIA doesn't make that distinction as far as the parts relevant to HTC's motion to transfer the claims it has to defend itself against out of Miami. The transfer will relate not only to six Apple patents insofar as HTC's products are accused but also to two former HP patents that HTC is asserting there against Apple. While the benefits of this to HTC (other than logistical efficiency) remain to be seen, the most likely beneficiary is Google subsidiary Motorola Mobility, which previously accused Apple of "gamesmanship" because of its decision to sue HTC in Florida in order to inflate the overall case and slow things down. I think Motorola is right that that's what Apple primarily intended to achieve, though there's no question that Apple is also serious about going after HTC. Back in May, the Miami-based court set a schedule that suited HTC's and Apple's needs (envisioning a trial in mid-2014) but was too slow for Google's (Motorola's) purposes. While Apple has some reasonably strong patents in action in Florida, this is the case in which Motorola asserted the six non-standard-essential patents it considered to be its strongest ones for the purpose of suing Apple, and Motorola is eager to get a decision on those claims (as well as six other patents it added to this action a couple of months ago). Google's Motorola Mobility could now be the primary beneficiary of HTC's successful motions to sever and transfer the Apple v. HTC claims out of Miami: this streamlining of the case may very well result in a faster schedule. On Monday (July 30, HTC filed a motion to withdraw U.S. Patent No. 7,765,414 on a "circuit and operating method for integrated interface of PDA and wireless communication system" from the investigation of its against Apple. As a result, the case is down from temporarily eight patents to only two allegedly standard-essential patents. HTC originally brought a second ITC complaint complaint over three patents, including the '414 patent, in August 2011. A few weeks later, already in September 2001, HTC "amended" its complaint in order to add five patents on loan from Google. In June 2012, Judge Thomas Pender threw out those five Google patents due to lack of standing. HTC appealed, but the Commission, the six-member decision-making body at the top of the ITC, denied its petition for review. Still in June 2012, Apple brought (and, in accordance with the ITC's procedural rules, immediately removed to a United States district court) its counterclaims against HTC over two allegedly standard-essential patents acquired from a company named ADT. Apple makes serious allegations of FRAND abuse. If Apple prevails on any of those counterclaims or its related FRAND defenses, then HTC's second ITc complaint will have failed in its entirety. Apart from FRAND, Apple could also prevail on its non-infringement and/or invalidity contentions, of course. The '414 patent was the only "homegrown" HTC patent at issue in this investigation. All of the other patents were obtained from other companies (five from Google, two from ADT). The case will go to trial in about a month. HTC's first ITC complaint against Apple (filed in May 2010) was symbolic, not substantive. The ITC dismissed it in February 2012. HTC filed an appeal with the United States Court of Appeals for the Federal Circuit but withdrew it in June 2012. Besides HTC's assertions against Apple in its own name, its subsidiary S3 Graphics is still pursuing two ITC complaints against Apple (in one case, this means an ongoing appeal of a dismissal). Its affiliate VIA Technologies also brought an ITC complaint against Apple last year, and the related trial will start today. Apple and HTC (including S3 Graphics) also have litigatio pending in Europe. In other news involving patent infringement lawsuits against Apple and Taiwan (HTC's home country), a lawsuit over two patents allegedly infringed by Siri's speech recognition technology was just brought in the Eastern District of Texas (the preferred venue of non-practicing entities) by Taiwan's National Cheng Kung University (NCKU). The Taiwanese government has previously shown a strong interest in Apple's patent lawsuits against HTC and potential future assertions against other Taiwanese companies. Should this university actually obtain an injunction against Apple (though this is a long shot for NPEs in U.S. district courts these days), it's quite possible that it would try to leverage its position in ways that benefit HTC and other Taiwanese companies. While jury selection is underway in the Apple v. Samsung trial in San Jose, California, the United States Court of Appeals for the Federal Circuit just issued a ruling that is moderately favorable to Samsung (though it has no bearing on the ongoing trial because it's related to a different case that Apple brought in February 2012 and that is presently scheduled to go to trial in March 2014). The appeals court decided to hold Samsung's motion to stay the preliminary injunction against the Galaxy Nexus smartphone, which Samsung co-developed with Google, in abeyance. In practical terms, this means (as the order clarifies) that the temporary stay (a stay until the court has decided on the motion to stay the injunction for the entire duration of the appeal) remains in effect. On June 29, Apple won a preliminary injunction against the Galaxy Nexus over a Siri-related unified search patent. On July 3, Judge Lucy Koh denied a Samsung motion to stay the injunction and Apple posted a $95.6 million bond. On July 6, the Federal Circuit granted an immediate, temporary stay of the injunction -- a stay until a decision on a stay for the entire duration of the appeal is made. A week later, on July 13, the appeals court granted Samsung's motion for an expedited appeal. According to that expedited schedule, the briefing process should be completed by early August at the lastest. On July 20, it scheduled a hearing for August 20. A decision on the appeal is likely to come down in the days or weeks following the hearing. Today's order doesn't indicate when the abeyance period for the motion to stay may end. Basically, the court can decide to adjudicate the motion whenever it believes it has obtained enough information and has had enough time to think about it. The court might make a decision after the briefing process, or after the hearing. I said that this is only "moderately favorable to Samsung". That's because it shouldn't be extremely difficult for the court to grant the motion to stay: since the appeal can be adjudicated anytime after the August 20 hearing, it would make sense to just stay the injunction for the remainder of the appeals process given that a disruption of its sales is clearly more harmful to Samsung than an extended stay is to Apple. If the court needs more information to decide on the motion to stay, Samsung must make some more headway to prevail on its appeal. The next major milestone is Samsung's reply brief, which it may (and presumably will) file on or before August 6. Ahead of the trial starting tomorrow in San Jose, Samsung just filed 14 objections to Apple's opening slides. The first one: "Samsung objects to the images of Steve Jobs appearing in Slide Nos. 6, 7, 12, 16, and 29 of Apple's Opening Presentation." "Evidence related to Steve Jobs will generally be excluded unless it is specifically relevant to the IP rights at issue in the case, although the Court will make that determination on a case-by-case basis." This is a situation in which Judge Koh will have to make a decision on specific references to Steve Jobs. To the extent that Apple's opening presentation references past events in which Steve Jobs was the protagonist, such as major product launches, there may be a factual basis for showing some of the pictures Samsung objects to, though the court might also agree with Samsung that "[t]he use of Mr. Jobs' image in these slides is not relevant to the specific intellectual property rights at issue in this case". Three of the images are "from a joint exhibit – 1091 (the MacWorld 2007 video), which Samsung itself relies on in its opening demonstratives (at Samsung slide no. 148)", so "Samsung cannot complain about Apple's use of the same video" that shows "the public introduction of the iPhone on January 7, 2007, which launched the fame that the iPhone trade dress has acquired". Also, "[b]ecause they demonstrate Apple's notice of the 200+ patents covering the iPhone -- including the asserted patents, they thus are relevant to willfulness". Another slide refers to an exhibition relating to Steve Jobs's patents, which was organized by the United States Patent and Trademark Office. "Among the highlighted patents at the PTO exhibit are at least two patents at issue in this litigation -- the D'677 and D'889" -- and Apple argues that "[t]he Patent Office exhibit demonstrates praise by others to rebut non-obviousness". The fifth image of Steve Jobs in the presentation is "a screenshot from the announcement of the iPad in July 2010" and, therefore, "relevant to the introduction of the iPad and its acquisition of fame and secondary meaning", Apple says. Samsung makes an equal treatment kind of argument: "If Apple is allowed to use these slides, Samsung requests that the Court allow it to use the quotes from Mr. Jobs -- which do have nonprejudicial evidentiary value -- and yet were excluded by the Court's ruling on Apple's Motion in Limine No. 7." Simply put, if Apple shows pictures of Steve Jobs in its opening presentation, Samsung wants to quote the part on "thermonuclear war" against Android from Walter Isaacson's Steve Jobs biography. But things aren't that simple. Quotes from that biography are just hearsay and were deemed inadmissible without any exception. As far as Apple's references to Steve Jobs are concerned, Judge Koh made this subject to case-by-case decisions, and we'll know soon how many of those five appearances in Apple's opening slides will be allowed by the court. I doubt that she's going to strike all five of them. 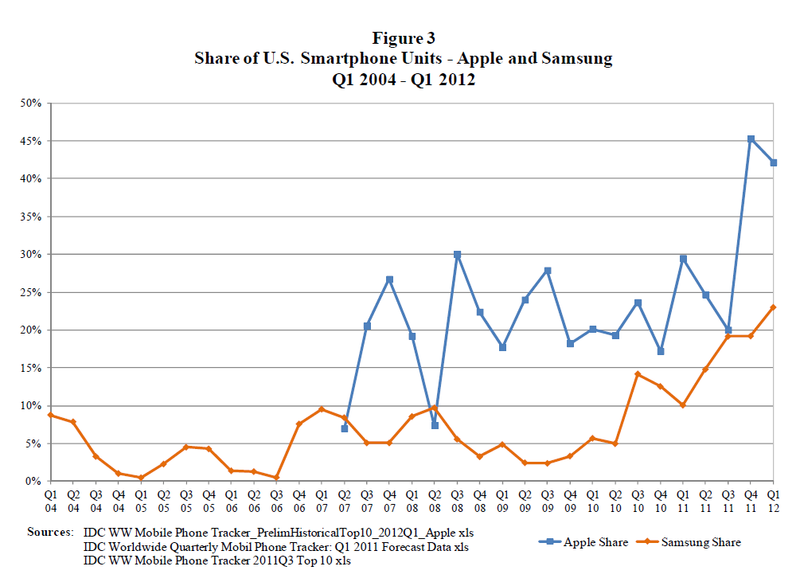 With a U.S. trial starting tomorrow (Monday, July 30), Apple's dispute with Samsung will likely dominate the headlines over the next several weeks, but from a strategic point of view, Apple's dispute with Motorola Mobility is even more important in light of that company's recent acquisition by Google, the maker of Android. In late June, the ITC commenced a thorough review of an initial determination that recommended an import ban against various 3G-capable Apple products (all Apple 3G products prior to the iPhone 4S and iPad 4G). The parties first filed their answers to the Commission's questions, and then a responsive brief to each other's submission. The responsive filings entered the public record shortly before the weekend. "In its opening submission, Apple recognized the possible exception of where a party ignored a prior court judgment setting a RAND royalty. Another possible exception is where a party is not subject to the jurisdiction of any U.S. court, requiring ITC intervention. Neither circumstance is present here." "Over the last few years, Apple consistently maintained its willingness to enter into a [F]RAND license and has sought to persuade Motorola to accept a [sic] [F]RAND terms. That Apple has refused to accede to Motorola's unfair demands does not make Apple an 'unwilling licensee.' Apple has concluded cross-licenses with many companies in the wireless industry, and stands ready to execute an agreement with Motorola if Motorola were to comply with [F]RAND." I don't know -- and may never find out -- what was said in any discussions between Apple and Motorola over these past few years. Motorola argues that it has been trying to get Apple to take a license since the launch of the original iPhone in 2007. Apple now says that it "has sought to persuade Motorola to accept [FRAND terms]". Whatever happened between 2007 and now, Apple has now undoubtedly made a commitment to take a license and pay FRAND royalties for Motorola's SEPs. While the words "stands ready" appear in the same sentence as Apple's reference to cross-license deals with other companies, this doesn't necessarily mean that Apple wants to include all of its non-SEPs in such a deal. In March, a European Commission document confirmed that Apple, according to its own representations, refused to grant Motorola a cross-license involving Apple's non-SEPs. Also, when Apple CEO Tim Cook spoke at the most recent edition of AllThingsD's D10 conference, he made a clear distinction between SEPs and non-SEPs, said he'd like to settle those assertions of SEPs against Apple, and stated that Apple "can't be the developer for the world". A cross-license deal between Apple and Motorola Mobility may involve some or all of Apple's non-SEPs, but in connection with the ITC investigation of Motorola's complaint against Apple, all that matters is that Apple is not an unwilling licensee: it wants a license to Motorola's SEPs, but as long as Motorola demands a 2.25% royalty based on the entire market value of Apple's products, there won't be a deal. I never doubted Apple's willingness to take SEP licenses on FRAND terms. I already said so in my recent analysis of a Dutch court ruling that Samsung is entitled to FRAND royalties and damages (though not to an injunction). But since Motorola has been claiming for some time that Apple wants to infringe rather than take a license, this clarification on Apple's part, in a publicly-accessible filing, is useful. Google (Motorola) now needs to go fishing for a new red herring. Approximately two weeks ago I reported on Google's motion to intervene in the ITC investigation of Nokia's complaint against HTC as an additional respondent. Since Google's motion was sealed in its entirety (apart from the headline), it wasn't immediately clear on which basis Google sought to become a co-defendant in that particular action, given that dozens of Android-related infringement complaints had been filed before in different courts without Google ever asking to join as a respondent. Thus far, Google was (unless it was sued directly) only a third party to Android-related infringement proceedings. A filing that HTC made in support of Google's motion on Thursday (which entered the public record on Friday) sheds some more light on this, and unless HTC omitted any important facts, it appears that there's absolutely nothing special about this Nokia-HTC action that would require Google's involvement any more than those dozens of other Android-related infringement cases I just mentioned. HTC argues that "Google is uniquely situated to provide information necessary for the efficient resolution of Nokia's infringement allegations with respect to at least five of the patents asserted in this Investigation, which are primarily directed to features of Google developed applications that are embedded in the accused HTC products". HTC also says that "Nokia's infringement charts for five of the asserted patents that were included with the Complaint specifically identify and rely upon features of Gmail, Google Calendar, or other aspects of the Android operating system in order to allege infringement by these accused HTC products". Android and Google-developed applications have been at issue in numerous other infringement actions, yet Google didn't seek to join those as a co-defendant: it contented itself with the role of a third party. For example, the "data tapping" patent that won Apple and import ban against HTC reads on Android's Linkify library. HTC's brief doesn't provide any indication as to why Google would not be able to provide whatever information it is "uniquely situated to provide" simply as a third party (the parties to the investigation would be free to subpoena Google anytime). HTC just says that "allowing Google to participate as a Respondent in this Investigation will avoid the need for complicated third party discovery with respect to those accused features", without specifying why third-party discovery wouldn't be sufficient, or why it would be "complicated". If a third party is particularly eager to provide information that helps the ITC adjudicate the issues, that only makes things easier, but even a party that doesn't volunteer to provide information will ultimately have to meet its legal obligations. The ITC is a trade agency, not a court, and its focus in Section 337 investigations is on distortions of competition resulting from the importation of infringing products. HTC imports devices allegedly infringing Nokia's patents. Google provides software to HTC, and it has to accept responsibility for the software it publishes, but Google's role here may not fall within the narrow scope of Section 337 investigations by the ITC. That said, I believe it's a positive thing that Google is willing to go further than before in its efforts to support Android device makers. HTC has been defending itself against Android-related patent litigation for almost two and a half years, and Google should have lent more support early on. The question is not if but how Google should come to HTC's (and other third-party device makers') aid. A recent transfer of patents from Google to HTC (for the purpose of countersuing Apple over them) fell short of a transfer of all rights, title and interest in the ITC's opinion. Now Google has brought a motion to join as an additional respondent that doesn't appear to state extremely compelling reasons. Nokia has opposed Google's motion in a brief that is just as sealed Google's motion itself. Based on HTC's brief (the only one in this context that is publicly-accessible so far), I'm not sure the ITC will see the need for Google to be anything other than a third party to the proceedings. Google can't force Nokia to sue it. Patent holders can sue anyone in the supply chain who creates or redistributes infringing material. With respect to Google's attempts to support its device makers facing patent issues because of Android's infringement issues, the Wall Street Journal reported on Friday afternoon that Google is leading a consortium bidding for Eastman Kodak's digital imaging patents. According to the report (which cautioned readers that things could still change before formal bids are submitted on Monday), Google has joined forces with HTC as well as Samsung and LG. Google has also brought in a patent aggregator named RPX that security software maker Kaspersky Labs accused of extortion, racketeering and wire fraud. This morning, Judge Andreas Voss ("Voß" in German) of the Mannheim Regional Court, who has already presided over more smartphone-related patent lawsuits than any other judge in the world, announced a ruling in Microsoft's favor against Google subsidiary Motorola Mobility. Motorola's Android-based devices have been found to infringe a File Allocation Table (FAT) patent: EP0618540 on a "common name space for long and short filenames". As I'll explain further below, a Linus Torvalds email that Motorola cited as prior art didn't ultimately persuade the court to stay this case for the duration of a parallel nullity action in the Federal Patent Court. This is already the third patent ruling in Microsoft's favor against Motorola Mobility. On a worldwide basis, ten Apple and Microsoft software patents have now been deemed valid and infringed by Android-based devices. In addition, certain Android-based Samsung devices have been held to infringe two Apple design patents. Or if you add up the two categories of patents, we're now talking about a dozen patents. Motorola Mobility is the only major Android device maker to refuse to take a royalty-bearing patent license from Microsoft. For example, more than 70% of Android devices sold in the United States have a license from Microsoft. Earler this month, Microsoft announced two more sign-ups (1, 2). Those licensees, which include the undisputed market leader Samsung as well as other major players like HTC, don't have to worry about possibly being sued by Microsoft. But Google appears to be fundamentally opposed to the concept of inbound licensing, though it's simply the way industry players commonly address patent infringement issues. With every licensee that Microsoft signs up and every court ruling that Microsoft wins, Google's ability to dissuade other Android device makers from signing a license agreement is further impaired, no matter how often Google chairman Eric Schmidt argues that Google, not Microsoft, created Android. Patent law doesn't work the way Mr. Schmidt implies. If today's ruling is enforced, Motorola Mobility will have to switch to a different file system (Linux offers various options) and, more importantly, its customers (who buy future products designed to work around this injunction, or who bought them before but download future system software updates) will experience a significant loss of convenience in connection with file transfers from and to their devices. As a Samsumg customer, I will continue to be able to simply plug my phone, with a USB cable, into my PC and read and write files to the phone like to any external storage medium. That's how I usually download photos or audio recordings. In connection with the technical implications of the decision, I'd like to point out that Judge Voss said at last month's trial that this patent does not have the exclusionary effect of a standard-essential one because there are other ways of organizing files. He gave Motorola Mobility one last chance to raise a FRAND defense, but its counsel remained silent. The court raised this issue in connection with the economic impact of this case, based on which the court determines its own fees and the attorneys' fees to be reimbursed by the losing party. The patent will expire in early 2014, and Motorola Mobility will definitely appeal today's decision and ask the appeals court, the Karlsruhe Higher Regional Court, for a stay of the injunction. But it won't be particularly easy for Motorola to win a stay since the Federal Court of Justice upheld this patent two years ago. While the prior art that was presented back then differs from the references cited in the Motorola case,. any patent that survives a contentious inter partes proceeding enjoys an enhanced presumption of validity. In its efforts to win a stay of the infringement proceeding in Mannheim, Motorola Mobility relied primarily on an email that Linus Torvalds posted to a mailing list in the early 1990s. The ITC (which also found the patent infringed by Motorola's Android-based devices) didn't overturn an Administrative Law Judge's finding that the Torvalds email, in combination with another prior art reference, rendered the patent "obvious" in his rather surprising opinion. Microsoft has appealed various parts of the ITC ruling, without a doubt including the one concerning the validity of the FAT patent; Motorola Mobility also appealed the decision, for a different set of reasons. In Germany, district courts are very reluctant to make a determination on obviousness. In almost all of the cases in which they stay infringement actions, they do so because they feel strongly that some prior art anticipated (and retroactively renders non-novel) the patented invention before it was applied for. Judge Voss recalled this fact on the occasion of today's announcement. He said that the court didn't rule out that this patent may ultimately be deemed invalid, but Motorola Mobility did not meet the threshold for a stay, which is that the court would have to consider it highly probable that the patent will be invalidated (the numerical equivalent would be a probability of 80% or greater). Microsoft and Motorola Mobility have brought a number of lawsuits against each other in the United States, Germany, and (for purely defensive purposes) the UK. Yesterday, the Munich I Regional Court cleared Motorola Mobility of infringement of a Microsoft patent on an event management architecture. But Microsoft previously won a U.S. import ban against Motorola Mobility's Android-based devices implementing an event scheduler feature (that import ban has meanwhile taken effect and presumably required Motorola to remove a feature that its licensed competitors can still provide) and a German injunction over a patent on a multi-part text message (SMS) layer. Prior to today's ruling, courts in different jurisdictions already found numerous Android-based devices to infringe 11 valid Apple and Microsoft patents. On Wednesday morning, Magistrate Judge Paul S. Grewal granted an Apple motion for an adverse inference jury instruction against Samsung on the grounds of spoliation of evidence. Samsung has now followed up on a footnote in which Judge Grewal stated that Apple's alleged "fail[ure] to issue litigation hold notices in August 2010 is irrelevant to the court's determination here. Samsung has always been free to argue, at the appropriate time, that Apple too is guilty of spoliation". Samsung says that now is the appropriate time (which I doubt given that the trial will start on Monday) and that the court should not hold Samsung to a different legal standard than Apple concerning the obligation to issue a litigation hold notice to employees in light of reasonably foreseeable litigation. [Update] Apple's first reaction to this motion was to bring a motion to strike this motion because it is, according to Apple, "untimely" (two court days before the trial). [/Update] Samsung even wants the court to tell the jury that litigation was more foreseeable to Apple since it initiated litigation while Samsung reasonably assumed that the parties would reach a business agreement as they did on some other issues in the past. There are very smart and serious people at work, and this is a strategically important lawsuit for a huge industry, but Samsung's motion bears an eerie resemblance to a child telling its parents that its sibling was guilty of the same behavior it was just punished for. "He too did that." I would not make a remark like that if Samsung's motion was at least remotely reasonable. But the objective is transparent, and even before Apple files its reply I can see a number of reasons for which the motion makes no sense whatsoever except that Samsung may hope that a U.S. court will always want to avoid being seen as applying double standards in a major commercial dispute between its own country's and an allied country's most valuable companies. But a ridiculous motion is still a ridiculous motion, and I don't think Judge Koh and Judge Grewal will hesitate to deny a motion that lacks merit. It's clear that Samsung brings this motion because it's afraid of the impact of the spoliation-of-evidence instruction on its credibility in the jury's eyes. If Samsung won the same kind of instruction against Apple, the jury might think that they're both equally untrustworthy, though in practical terms the lost emails on Samsung's part were most likely very relevant to the willfulness question while it's a safe assumption that even if any emails were lost on Apple's part, they wouldn't make a difference. In fact, Samsung suspects that some emails of inventors of some of the asserted design patents got lost. In a formal sense, such emails may have to be produced, but they don't change anything about validity or infringement. Even if Samsung's motion succeeded, a sophisticated jury would understand this, but it's all about the perception of the kinds of people who usually serve on juries. In Korea, Samsung employees mostly use an email system named "mySingle" that was developed internally and has a periodic deletion mechanism. Samsung got into trouble with another U.S. court seven years ago because of this, and didn't solve the problem. With all of Apple's litigation, we'd know by now if Apple had ever had any similar problem. Presumably, Apple's employees use an email client that doesn't auto-delete. Samsung argues that August 2010, when Steve Jobs and Tim Cook met with Samsung to discuss infringement, was the time when Apple should have issued a notice to employees to retain emails that might be relevant to future litigaiton with Samsung. But Apple already sued HTC in March 2010 and had been embroiled in litigation with Nokia since 2009. So there definitely were some retention rules in place at Apple at the time. It's possible that any notices in the HTC and Nokia contexts didn't explicitly mention issues relating to design patents, but in that overall context I doubt very much that Apple lost any emails relating to its intellectual property of any kind. Samsung would have to show a factual basis on which the material that allegedly may have been lost would have been favorable to Samsung. Its motion doesn't make a showing of harm. By contrast, Apple was able to point to some evidence that supported its theory of willful infringement, and it wasn't unreasonable to extrapolate from the available evidence to what a complete body of evidence might have shown. The fact that Samsung didn't bring a spoliation-related motion before shows that it never really felt prejudiced by anyone or anything. Samsung deserves its day in court, starting Monday, just like Apple. And as far as the presumed validity and alleged infringement of Apple's asserted intellectual property rights is concerned, it will bring a number of defenses, some of which are pretty good. But there are contexts in which I don't think Samsung has a point. This here is one of them. Oddly, this "me too" motion will serve to reinforce some people's impression that Samsung copies Apple. Three of the court rulings that have so far found Android devices to infringe 11 valid Apple and Microsoft patents came down in Munich. After Judge Koh's court in San Jose in the Northern District of California, this makes the Southern German city, which is also the seat of the European Patent Office and the German Federal Patent Court, the toughest terrain for Android worldwide. But people in Munich are getting ready for the main vacation season, and today Android was cleared of violation of one Apple and one Microsoft patent. This morning, the leading German news agency dpa reported that the Oberlandesgericht München (Munich Higher Regional Court) affirmed the Munich I Regional Court's denial of a preliminary injunction that Apple had requested against Samsung for alleged infringement of the "overscroll bounce", or "rubber-banding", patent. The lower court had based its decision in February on doubts about the validity of this patent. The appeals court has now affirmed that ruling. A decision on a motion for a preliminary injunction (even if it's made by an appeals court) is, by definition, not final. It's based on an assessment of the plaintiff's chances of prevailing at the end of the main proceeding. Decisions on preliminary injunction motions (including the related appeals) are made on the fast track, and final decisions are made at the end of full-blown main proceedings. Shortly after the Munich Regional Court's denial (and even prior to the appeal that was adjudicated today), Apple asserted the overscroll bounce patent in Mannheim (instead of pursuing the related main proceeding in Munich). Apple also asserted it against Motorola in a different proceeding in Munich (in which Apple did not request a preliminary injunction). A decision on that one will be announced in two weeks (August 9). Today's decision by the appeals court in the same city doesn't make things easier for Apple in that action against Motorola. The overscroll bounce patent will also be at issue at the California trial starting next week. Judge Koh deemed that patent likely valid and infringed in a decision on a motion for a preliminary injunction, but denied injunctive relief for equitable reasons. It's possible that Samsung will file a request for judicial notice of today's Munich decision, but the legal systems are different and I doubt that the Munich appellate decision will have any impact on the upcoming decision in California. In the afternoon, the Munich I Regional Court announced a decision on a Microsoft v. Motorola Mobility lawsuit (actually split up into two lawsuits by the court, one against Motorola's German subsidiary and one against its U.S. parent company, for administrative reasons). A lawsuit over an event management architecture patent was thrown out because the court was unconvinced of Android's implementation of the relevant technique falling within the scope of this patent. The Munich I Regional Court was originally expected to rule on another Microsoft patent action against Motorola today, but a decision on a soft input panel patent was postponed until September. Tomorrow, the Mannheim Regional Court will rule on a Microsoft v. Motorola Mobility lawsuit over a file system patent. Last month, the top-level decision makers of the ITC remanded the investigation of Google subsidiary Motorola Mobility's complaint against Microsoft's Xbox gaming console to Administrative Law Judge David Shaw. Motorola was hoping to win an import ban in time for this year's Christmas Selling Season, especially after Judge Shaw's preliminary finding was that the Xbox infringed four presumed-valid Motorola patents. But the Commission, the six-member decision-making body at the top of the ITC, told Judge Shaw to reevaluate his preliminary findings in light of a Microsoft motion related to Google's grant-back obligation under its own license agreement with MPEG LA and an important recent precedent concerning method patent claims (HTC subsidiary S3 Graphics' first ITC case against Apple). Upon remand, Judge Shaw's first order requested discovery statements from the parties, including proposals for the target date and other key milestones. While Microsoft argued that the issues to be addressed on remand can be decided without any further discovery (since an evidentiary record has already been developed), Google (Motorola) wanted to reopen the record and raise a variety of issues that came up in the S3G csae. Motorola proposed a May 2013 target date. Microsoft suggested August 2013. In an order issued yesterday that entered the public record today, Judge Shaw came down closer to Microsoft's proposal as far as the target date is concerned. Based on his determination, the target date for the final decision is July 23, 2013 (31 months after institution of the investigation), and the judge will make his post-remand initial determination on March 22, 2013. A hearing has been set for December 5 and 6, 2012. Judge Shaw agreed with Motorola that "the parties may raise any issue in the remand proceeding as long as it is limited to issues raised under the holdings in the Electronic Devices [S3G v. Apple] opinion". The judge believes this is appropriate because "[t]he Commission's order [remanding the investigation] did not limit the remand proceeding to any particular issue raised under the holdings in the Electronic Devices opinion". The ITC's remand order just told the judge to "apply the Commission's opinion" (i.e., final ruling) in the S3G case. At this point it's not clear to me whether there's anything in the S3G decision that was new caselaw and would help Motorola. The S3G holding that the ITC can't order import bans on the basis of method patent claims that may be infringed post-importation but aren't infringed at the time of importation can only help the defendant (which in this case is Microsoft). Microsoft could appeal this order to the Commission in an effort to limit the scope of the remand. At any rate, there's no question that the tide has turned in this ITC investigation and a case that was going fairly well for Motorola up to a certain point is now an uphill battle for the Google subsidiary. And time is not on Motorola's side. In the meantime (in November to be precise), there will be a trial in a federal lawsuit that Microsoft brought to enforce Motorola's FRAND licensing obligations. The objective of that action is a license agreement on terms set by the court, which would take care of the standard-essential patents at issue in the Xbox case at the ITC. On a related note, there will be three decisions by German courts this week on Microsoft v. Motorola Mobility cases: two in Munich tomorrow, and one in Mannheim on Friday. At 1 AM local time, Magistrate Judge Paul S. Grewal just entered an order that considerably ups the ante for Samsung's persuasive efforts at the trial starting next Monday. The jury will receive an adverse inference instruction with respect to Samsung's spoliation of evidence by failing to retain relevant messages on its corporate email server even at a time when litigation was "reasonably foreseeable". In essence, the jury will be told that Samsung failed to comply with its obligations to preserve evidence, and the jury may (though it need not) presume that relevant evidence that would have been favorable to Apple was destroyed. This must be a nightmare for a trial lawyer who tries to enhance his client's (and demolish his adversary's) credibility. For an adverse inference jury instruction, this is relatively soft. The court could also have told the jury that it "must" presume that relevant evidence in Apple's favor was lost, or in a worst-case scenario for Samsung, that certain of Apple's claims must be deemed proven. But the fact that the outcome could have been worse, or even much worse, for Samsung doesn't mean that the above isn't pretty useful to Apple. In connection with any claim made by Apple, Samsung will either need to have some credible rebuttal evidence available or otherwise some or all jurors might assume that Apple could have proven its claim if not for Samsung's established "spoliation of evidence". It also doesn't make Samsung look good, generally speaking. One context in which this evidentiary issue is particularly relevant is the question of whether Samsung willfully infringed on Apple's intellectual property -- the "copycat" story. Infringement and validity are technical issues that shouldn't depend on whatever emails were automatically deleted on Samsung's corporate email system (though a given party's credibility can also influence whether jurors are inclined to believe that there is an infringement of valid rights). It's the whole willfulness context in which internal communications play a key role. "Joon-Il Choi, a senior manager in Samsung's R&D Management Group, did not produce any emails. Mr. Choi, however, presided over and wrote notes for a meeting that Gee-Sung Choi, Samsung's former President and CEO of its digital media division and current Vice Chairman of Corporate Strategy, attended on March 5, 2011, to discuss alterations to the Galaxy Tab 10.1 to make it more competitive with the newly released thinner iPad 2." Samsung's own trial brief argues that it's perfectly normal for competitors to conduct "benchmarking" of their products against those of their rivals in order to identify areas in which they need to improve. Samsung says Apple is no exception. While that makes sense, it won't necessarily persuade your average juror as much as it would an industry expert. Someone who is unconvinced of the "benchmarking" theory would probably want to see the emails that were exchanged internally. But the judge will tell the jury that some of this evidence was destroyed. In a quantitative sense, this case doesn't suffer from a shortage of evidentiary material. Approximately 38.4 million pages (!) form the evidentiary record in this case. But some of the potentially most enlightening material got lost because Samsung, in the court's opinion, failed to do what it had to do. This trial is going to be a tough fight. We're not going to see two business partners handling each other with kid gloves (though they still do a lot of business on the component side). Whether Wall Street is right or not to be somewhat disappointed with the numbers Apple announced yesterday, there can be no doubt that Apple would have sold more iPhones last quarter, despite all of the anticipation of the iPhone 5, if Samsung had not sold that many Galaxy phones. 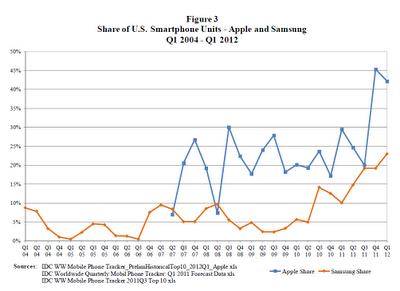 And in the current quarter, the wildly popular S III is going to give Apple a hard time. Also, Samsung continues to run advertisements that make fun of Apple in ways that won't always seem funny to the decision-makers in Cupertino. Losing is not an option for Apple in this dispute. And in this overall situation, an adverse inference jury instruction makes things even harder for Samsung. In my opinion, Judge Grewal's order gives Samsung the benefit of the doubt in some respects in which other judges might have seen evidence of recklessness and ordered even tougher sanctions. The order starts with an explanation of how Samsung already had a problem with discovery rules governing U.S. lawsuits when it defended itself against a patent assertion entity named Mosaid seven years ago. At that time, Samsung was already told that the automatic deletion of emails on its corporate server after two weeks, which Samsung argues is necessary because of Korean privacy rules, is inconsistent with retention obligations under U.S. law. Samsung employees are free to use Microsoft Outlook, and it appears that Outlook is the email client Samsung's employees based outside of Korea use primarily. But Samsung's most senior leaders are based in Korea and use "mySingle", which was developed internally by some entity within the Samsung group. Even with that one, employees could always make local copies of emails, and Samsung did make many employees aware of the possibility of litigation with Apple, but it didn't really follow through to ensure that emails were retained. As a result, those Samsung employees who use Outlook made far larger number of emails available to discovery than those using mySingle. Samsung apparently complied with all those rules after litigation started. But the legal standard is that litigation must be "reasonably foreseeble". An August 2010 meeting in Korea, attended by Steve Jobs and Tim Cook on Apple's side, was all about Samsung's alleged "infringement" of Apple's rights, but "Samsung euphemistically refers to Apple's infringement presentation as a 'licensing discussion.'" And when Samsung made many employees aware of a potential dispute with Apple, it also noted that litigation would only happen "unless a business resolution can be reached", a possibility that always exists in theory and can't serve as an excuse for non-compliance. Apple has already won some other useful pre-trial decisions. While Samsung also won monetary sanctions against Apple in a couple of instances, those won't affect the parties' chances at the upcoming trial. But an adverse inference jury instruction can tilt the scales in Apple's favor in such contexts as willfulness. Should Samsung be found to have infringed willfully, some components of Apple's $2.525 billion damages claim could be tripled. A finding of willfulness would also increase the likelihood of injunctive relief. With their California trial approaching fast, Apple and Samsung made filings during the last few hours that shed light on what's at stake and on why the parties haven't been able to settle their dispute so far. "Samsung adopted as its number one goal to [redacted]' in the smartphone and tablet markets, and it chose to compete by copying Apple. Samsung's infringing sales have enabled Samsung to overtake Apple as the largest manufacturer of smartphones in the world. Samsung has reaped billions of dollars in profits and caused Apple to lose hundreds of millions of dollars through its violation of Apple's intellectual property. Apple conservatively estimates that as of March 31, 2012, Samsung has been unjustly enriched by about [redacted; presumably $2 billion] and has additionally cost Apple about $500 million in lost profits. Apple also conservatively estimates that it is entitled to over $25 million in reasonable royalty damages on the proportionately small set of remaining sales for which it cannot obtain an award of Samsung's profits or Apple's own lost profits, for a combined total of $2.525 billion." In connection with Oracle v. Google, some malicious individuals as well as some gullible people (who parrot lies without fact-checking) later claimed that my purely factual reporting on what a public Google filing said Oracle demanded (which Oracle later corrected anyway) was a prediction of the outcome. Based on that experience, I'll clarify, out of an abundance of caution, that a party's claims are one thing and the court's decision are another. There's almost always a difference, and it can be huge. But a defendant that goes into a trial and faces a certain claim from the other party knows what worst-case exposure is. The largest part of Apple's $2.525 billion claim, an amount of $2 billion, is related to Apple's demand for a disgorgement of Samsung's total profits with products that infringed its design patents. A disgorgement of profits is not available with respect to technical patents. But once Apple collects all of Samsung's profits on an allegedly infringing device, it can't claim a "reasonable royalty" on those devices. 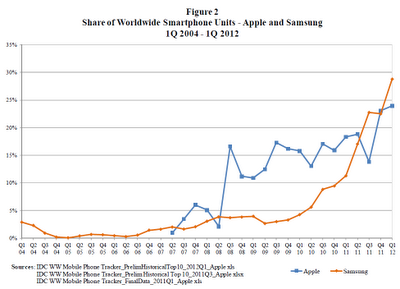 That's why Apple's "reasonable royalty" demand of $25 million relates only to a few products. Samsung's best-selling products are the ones that look most similar to the iPhone and the iPad. The $2.525 billion amount could still increase. Apple argues that Samsung infringed willfully. As a result, some components of that overall figure could be tripled. This damages claim relates to past infringement. If the court granted Apple's request for a permanent injunction against Samsung, infringement would end. If there are any infringements that the court identifies, but the court doesn't grant Apple injunctive relief to stop those infringements, then the court will have to award Apple a reasonable royalty going forward -- which has the effect of a compulsory license. Apple bases these demands on studies according to which the features and techniques covered by those patents drive demand. For example, a "conjoint survey" conducted by one of Apple's experts "shows that Samsung's customers are willing to pay between $90 and $100 above the base price of a $199 smartphone and a $499 tablet, respectively, to obtain the patented features covered by Apple's utility patents". Indeed, we are talking about features that make an iPhone an iPhone and set it apart from a feature phone or from what today's Android phones would be like if Google had not decided at some point to abandon its original plans for a more BlackBerry-style device and copy the iPhone operating software. And as high as those royalty rates may seem at first sight, Apple would much prefer an injunction over that per-unit royalty. Product differentiation is more valuable to Apple than compulsory licensing. Apple looks forward to a trial that will vindicate its intellectual property rights. Samsung must play by the rules. It must invent its own stuff. Its flagrant copying and massive infringement must stop." Samsung's counterclaims in this case involve, after the latest narrowing, two standard-essential patents (SEPs) and three non-SEPs. Its non-SEPs are anything but frightening. Its SEPs, however, raise antitrust issues. Samsung has an obligation to license its SEPs on FRAND terms. It cannot withhold a license; a workaround would not be an option. And its license fee demands must be based on the value those patents had before the techniques they cover were incorporated into industry standards. 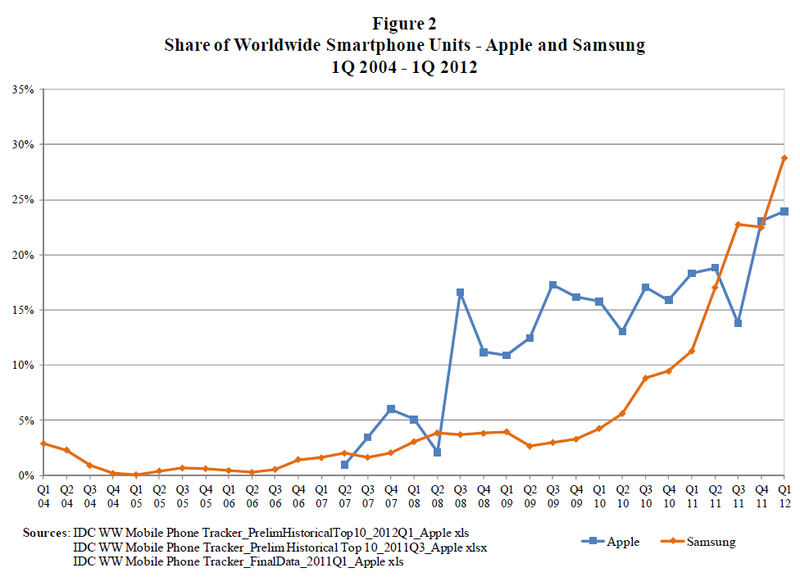 Samsung is known to have demanded 2.4% of Apple's sales as a royalty for its wireless SEPs. That figure showed up in an Italian court ruling and was mentioned in open court in The Hague, Netherlands, by Apple's Dutch counsel. I'm not aware of any reduction of that figure. "A. To The Extent That Samsung Is Entitled To Any Remedy, its FRAND Damages Cannot Exceed $0.0049 Per Unit for Each Infringed Patent"
That's half a cent per unit per SEP. At first sight, this may appear very low, but Apple explains that it arrived at this figure by comparing it to other license deals involving SEPs that it has done. 3G/UMTS is just one of many standards Apple's products implement, and "Samsung's declared-essential patents represent only a small portion of the total set of declared essential UMTS patents--around 5.45%". Apple argues that the proper royalty base for Samsung is not the entire market value of Apple's products, "which contain computer and application functionality far beyond simple UMTS wireless technology". Instead, "the royalty should be applied to a base equal to the price of the baseband processor, the smallest priceable unit containing the accused functionality". In a letter to the Senate Judiciary Committee's leadership (a letter that rebutted attempts by Google to blur the distinction between SEPs and non-SEPs), Apple used an analogy and said that all car drivers pay the same highway toll, whether they own a jalopy or a new sports car. Seen in that light, Samsung's SEPs cover a part of the functionality of the baseband chip. And such baseband chips sell in the $10-per-unit range. That's a completely different value proposition than the entire market value of an iPhone or iPad, but that's the way it is. Yesterday, Reuters reported, citing unnamed sources, that Apple CEO Tim Cook and Samsung vice chairman Choi Gee-sung met again last week to discuss a possible settlement but couldn't reach an agreement on the value of their respective patents. Looking at the numbers revealed by Apple's trial brief, and comparing Apple's half-cent-per-patent offer to Samsung's 2.4% demand, there can be no doubt that they are worlds apart. Even though parties obviously take extreme positions when they go to court, there are too many indications that Samsung hopes to be able to command outlandish royalties for its FRAND-pledged SEPs in order to gain leverage in a cross-license deal with Apple. At first sight, Apple's demands and what it thinks Samsung is entitled to may give the impression of double standards, but let's look at this analytically. First of all, the $2.525 billion figure can't be compared to the half-cent thing. Space constraints required me to mention those two key figures in the same headline, but that doesn't mean that they're comparable. They are not. The $2.525 billion claim is largely about unjust enrichment and lost profits. If we want to compare Apple's position on the value of SEPs to its position on the value of non-SEPs, we have to compare Apple's positions on reasonable royalties. Even on that basis, I'm sure many people's first reaction is going to be disbelief that the "overscroll bounce" patent (or the "tap to zoom and navigate" patent) should be worth more than 400 wireless SEPs. And I'm not going to subscribe to a particular factor such as 400 -- that factor would be contracted if one adjusted the numbers on both ends of the spectrum. But I do agree with Apple that the difference between the commercial value of its multi-touch non-SEPs and that of Samsung's wireless SEPs is huge, not small -- and fundamental, not just gradual. Apple is absolutely correct that the proper royalty base for wireless SEPs is the market value of baseband chips. The cost of manufacturing such chips is not important. What's important is that those chips typically come with many, if not all, of the required patent licenses. By contrast, features like "rubber-banding" are signature aspects of the iPhone and the iPad. They allow an iPhone to sell at several times the price of a feature phone. They played a certain role in making the iPad the world's first commercially-successful tablet computer. As I wrote further above, Samsung could simply "invent its own stuff" (as the concluding paragraph of Apple's trial brief proposes) and steer clear of infringement of Apple's non-SEPs. With respect to "rubber-banding", Samsung has already implemented a workaround that I'm convinced doesn't infringe anymore. But if Samsung absolutely wanted to copy Apple's creations, and if the court denied an injunction to stop such infringement, the price might be significant on a per-unit per-patent basis. At some point, Apple and Samsung will settle. The price for Samsung to pay will be a significant per-unit royalty rate, and it will have to accept restrictions in terms of which Apple patents it's allowed to use and in which ways. Samsung will ultimately get paid for its SEPs, but the amount will be tiny compared to what Samsung owes Apple if it chooses to license its non-SEPs. That's because Apple's patents make the difference between a $50 phone and a $500 device, while Samsung's patents cover a small part of what a $10 component of such products provides. If Samsung's SEPs could be worked around without becoming non-compliant with an industry standard, Apple could work around each of them at a fairly low cost. Samsung is not entitled to compensation based on the value of standard-setting itself: that would mean to reward companies for participation in a cartel rather than for its actual contribution to innovation. Its trial brief makes clear that Apple considers Samsung an illegitimate market leader, a leader who owes his success to infringement, and it's absolutely determined to defend its intellectual property rights in order to regain market share. This California trial will be a major event, but it's only one of more than 50 lawsuits around the globe. Even in California, there's a second case pending that is currently scheduled to go to trial in 2014 (the preliminary injunction against the Galaxy Nexus smartphone is a first offspring of that litigation), and Apple has the right to reassert in subsequent litigation any or all of the intellectual property rights it withdrew from this lawsuit. This is going to be a marathon, not a sprint, but Apple could score a major breakthrough this summer -- and in an ideal scenario for Cupertino, Samsung will then realize that it can't win, and back down.